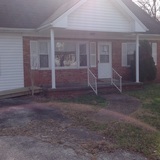 3 Bedroom - 2 Bath Brick and Frame Home - Huge Sun Room - Lots of Hardwood - Many Recent Improvements - Move In READY! A PLACE WHERE DREAMS COME TRUE! A beautiful home located on 3.8 acres that is fenced and cross fenced has its own pond ready for horses, cattle, or a large garden there is plenty room for whatever you like.